Youth Theological Initiative Summer Academy participants worship in Cannon Chapel. A $600,000 grant from Lilly Endowment Inc. will make way for a new program at Emory University geared toward connecting high school students to theology and faith. Emory’s Office of Spiritual and Religious Life (OSRL) will partner with Candler School of Theology to facilitate Emory IMPACT (Immersion in Meaningful Practices of Action, Community and Theology), a four-pronged approach designed to invite a wide range of Christian high school youth to deepen their spiritual lives and embody their faith in the world. The four-year grant is part of Lilly Endowment’s High School Youth Theology Institutes initiative, which seeks to encourage young people to explore their religious beliefs and their concerns about contemporary challenges by studying theology and examining how faith calls them to lives of service. The initiative’s ultimate aim is to identify and cultivate a cadre of theologically minded youth who will become leaders in church and society. Bridgette Young Ross, the university’s dean of the chapel and spiritual life, will head the program. "Emory IMPACT reflects Emory University’s belief that education can be a strong moral force in both society and the lives of its individual members,” she says. “It stands to play a critical role in developing a new generation of leaders with moral and spiritual grounding who can connect their convictions to their analysis of contemporary challenges and lead organizations with vision and creativity." Emory IMPACT will build on the success of Candler’s Youth Theological Initiative (YTI). 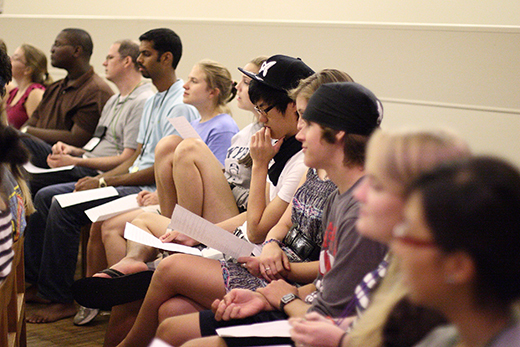 Established in 1993, YTI has educated more than 1,000 youth from across the United States and around the world during its three-week Summer Academy, where participants wrestle with deep theological questions in a supportive community of peers and are taught by seminary students and Candler faculty. Elizabeth Corrie, director of YTI and associate professor in the practice of youth education and peacebuilding at Candler, will serve as the faculty advisor to Emory IMPACT. The program is designed to address current challenges that hinder young people’s exposure to theological education, including schedules that don’t allow time for long-term summer programs; school-required service projects that lack engaged reflection; using social media in place of face-to-face relationships; and the frequent departure of young adults from religious communities. Taste of YTI: Finding God in the City,a four-day, five-night residential program on Emory’s campus for rising 10th, 11th and 12th graders that will offer the opportunity to engage in intentional community, theological reflection and contextual learning in an abbreviated timeframe. The shorter time commitment will allow more young people to benefit from the YTI experience. Praying with our Feet and Journeys of Faith and Reconciliation travel seminars that will engage rising 11th and 12th graders in the theological, ethical and practical dimensions of mission, service and peacebuilding in the United States and abroad. Praying with our Feet will draw on the Civil Rights history of Atlanta, Birmingham and Selma, as well as current movements for racial justice. Journeys of Faith and Reconciliation will examine the religious peacebuilding process among Protestants and Catholics in Northern Ireland. Taking Faith to College, a one-day workshop to be offered multiple times a year at Emory, designed to engage youth in the theological, ethical and practical dimensions of the transition from high school to college and provide tools to aid the growth of their faith into adulthood. Participants in 9th through 12th grades will connect with campus ministers, learn about the role of religious life in college and engage in critically reflective, theologically rich conversations on various aspects of college life. Emory will begin offering Taking Faith to College this fall. Other programs will launch in summer 2017. Corrie believes that the OSRL’s partnership with Candler and YTI will be critical to the new program’s success. "Because this program will use pedagogical approaches similar to those that have been honed over 23 years at YTI," she says, "we have confidence that Emory IMPACT will help young people gain greater facility and interest in theological reflection in their lives, their local communities, current events and the larger issues we face in the church and the world."